They are back! UMD makes their return to AMSOIL Arena, the fifth game at home in 12 this season. The season is just over one-third completed and this is the fifth and sixth games at home. Good news is Bulldog fans can look forward to seeing more games in home whites going forward. Looking Forward. This is the first full weekend of conference games for the fledgling NCHC. It is about time as the conference piece meals conference games together sating with UMD and three other teams starting mid – October. Piece that together with UMD and WMU each with four NCHC games while UND and CC with eight. The standings are skewed soon to be on the mend as more full conference weekends are on the horizon. Looking Back. Placing both Alaska team in the same conference, the new WCHA, was a possible problem from the start. Michigan Tech may be the first team to feel the effects. Tech traveled to Anchorage for a series the weekend before Thanksgiving then spent their week in the 49th state before playing at Fairbanks the weekend after. It makes sense on the budget and with a three day school week (insert athlete/class joke here). But think about what the students did all week. I don’t think I would want to be there on a student budget for a week. Hopefully the University helped out with some good experiences. Facing the Cream. This weekend marks the third series this season where UMD faces a top two team, as ranked in the polls. 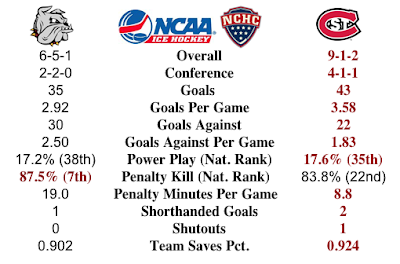 SCSU is currently #2 in the polls. As a result, the Bulldogs have the 5th ranked strength of schedule (SOS). Comparatively, the Huskies have the 16th ranked SOS. Making a Statement. After all the splits UMD has been having, this weekend would be a great one to come out and take a sweep. Both in conference and ranking, two wins would be a great boost to the young team. Picks by @afiskness. After a week off the Bulldogs should be eager to be on the ice again at home in Duluth. This weekends series against the Huskies is a great one that should have a lot of fan interest. I would like to see the Bulldogs put together back-to-back solid efforts in these two games. This weekend also see all eight NCHC teams in action. 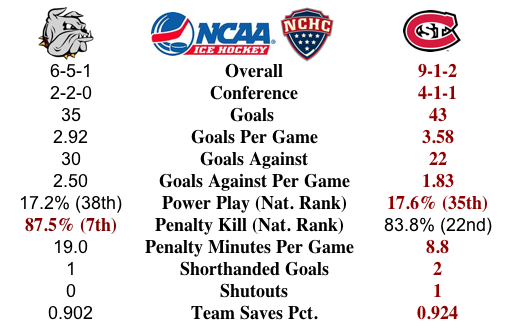 This weeks NCHC gamesSt Cloud State @ Minnesota Duluth: Great series between these to teams. Playing at AMSOIL should help the Bulldogs, but the Huskies are good and this will be a split. North Dakota @ Western Michigan: I am still not sure what North Dakota is going to be each week. The games being played at Lawson gives the Broncos the edge, but I think North Dakota will get a split. Denver @ Miami: I like the Redhawks in this series playing at home, but I think the Pioneers will find a way to get a tie. Redhawks win and tie. Nebraska Omaha @ Colorado College: The Tigers are not playing very good hockey, but I don't think the Mavericks will get the sweep on the road. I will say Mavericks win and tie.